If you have hundreds of favorite movies on DVD and want to bring it all with you on the go, the Seagate Wireless Plus is arguably the best choice on the market. The Seagate Wireless Plus can relay Wi-Fi Internet access and works well as a fast portable drive or as a robust mobile media server. However, you need to do some work in advance before saving DVD movies on Seagate Wireless Plus. I mean you need to convert and rip DVDs for uploading to Seagate Wireless Plus. To finish the task, a DVD to Seagate Wireless Plus converter is essential. Here EaseFab DVD Ripper is highly recommended. The program can not only rip DVD to Seagate Wireless Plus with super fast conversion speed and excellent image and sound quality, but also backup your DVD disc with whole content copy or backup main movie. After that, you can easily upload DVD collections to Seagate Wireless Plus and reach DVD movies on iPads, laptops, tablets and smartphones. If you are a Mac user, you can turn to EaseFab DVD Ripper for Mac(EI Capitan compatible), which has the same function as the Windows version. Now let's have a closer look at the basic steps. PS: If you have movies on both Blu-ray and DVD discs and want to copy DVD/Blu-ray to Seagate Wireless Plus for widely sharing, you can turn to EaseFab Blu-ray Ripper. Tip: Highlight the movie title you want to rip, and then you can click the dropdown menu after "Subtitles" and "Audio" respectively to select your wanted subs and audio track to be preserved in the resulted files. As Seagate Wireless Plus is powerful enough to support almost all kinds of formats, you can choose the format according to your own needs like MP4, MOV, AVI, MKV, etc. 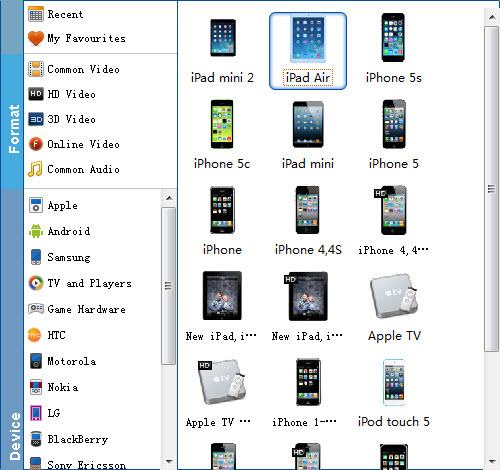 If you would like to enjoy movies from physical discs to your mobile phone and tablet, you can select a decent format like "Apple > iPad Air" from the profile list comes with the software. Tip: Click Settings bar, you can adjust the level of compression to suit the quality you want. If you prefer a much better video quality and don't mind the output file size, you can rise the video bit rate higher. Generally speaking, the higher video bit rate will result in the larger output file size, and vice versa. Hit the "Convert" button to start ripping DVD movies to MP4 format for free access by Seagate Wireless Plus supported multimedia devices. 1. Connect to the Wireless Plus network from the device where you've downloaded your movies. 2. From the Wireless Plus main screen, navigate to one of the media views: Videos, Photos, Music, Documents. 3. Click the Upload button on the top menu. 4. Enter the file name or click Browse and then locate the file you want to copy to your Wireless Plus device. 5. Click Upload. The file will be added to the category you selected. Now you can take your favorite DVD movies with you on Seagate Wireless Plus and watch them wherever you go, no wires necessary.